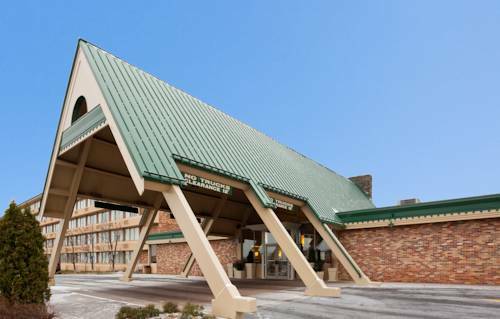 The beauty and majesty of nature surround our hotel's location in the Upper Peninsula because the Holiday Inn Marquette hotel is located off US 41, and just a stone's throw from downtown, guests find it easy to get around the Marquette, Michigan area. Our hotel's location and facilities are ideal for corporate guests. Finish-up any last minute paperwork in our Business Center with free Wi-Fi access and printing. Your next meeting will be a hit in one of our six well-equipped meeting rooms. In addition, U.P. Health Systems, Upper Peninsula Medical Center and Northern Michigan University are all located within two miles of the hotel's address. Here in the Upper Peninsula there is always something to do and discover. A visit to the UP Children's Museum can make an impression that will last a lifetime. Hike one of the area's trails, and you may encounter a tranquil waterfall around the next bend. Guests can even find some of the biggest stores in the area here in Marquette, Michigan. The hotel's great services and amenities are sure to impress! You can unwind in the sauna or make a splash in the indoor, heated pool or whirlpool and workout in the Fitness Center to relax and recharge. My Place Restaurant always serves delicious food, and the Lounge often has live music. My Place: Experience local favorites in a relaxed, inviting atmosphere in My Place Dining Room. There are a variety of mouth watering entrees to tempt even the most discerning of customers. Harley's Dining Room: Offers a wide variety of flavorful menu selections, along with daily specials for breakfast, lunch, and dinner. Superior "Yooper" DomeThis is the largest wooden dome in the world. It hosts many of the area's athletic events.